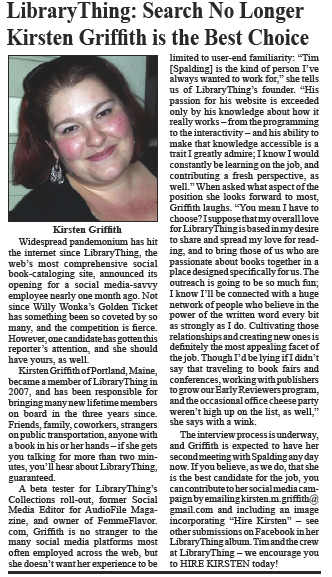 As many of you probably know, and have known for some time, LibraryThing is hiring. I have been squeeing about this for almost a month, and have been working on a bit of a photo campaign over on Facebook. The latest submission is kinda hard to read (the main idea was just to get the article on the front page, which looks AWESOME – thanks, JC!!! ), but as the full text has been requested, here it is for your reading pleasure. Clicking the image below will bring you to the full front page view. Happy holiday/long weekend to all!